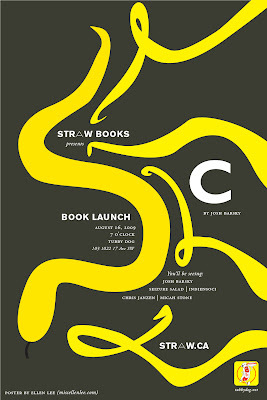 I did this poster for Josh'sbooklaunch (August 16, 7 o'clock, Tubby Dog in Calgary, AB!). I like the whole thing for the most part but I kinda feel like the typeface I chose for "C" isn't quite right, it's set in Gill Sans Bold and I dunno if you have any suggestions that be cool. But if any of you who read this are going to Calgary or are from there, you should totally go cause I would, I mean come on, hot dogs and books! I have been watching Mad Men a lot more lately (I started watching it awhile back and just kind of lost interest) and the opening credits just kill me (always did and probably always will), I absolutely love the music, so epic! Speaking of epic, the music in Moon is so good! I kind of felt that was a big part of holding that movie together and making it 500 times more intense and interesting, without it I think it could have easily fallen apart.